There are 3 topics in this incidental personal blog to share. They are all related or associated at the same place, different events and different memories. The lineage of the same person from generation to generation. From Hock Lam to Funan blog to share with thanks to Remember Singapore. View of Hock Lam Street from North Bridge Road with a celebratory banner and buntings for National Day. 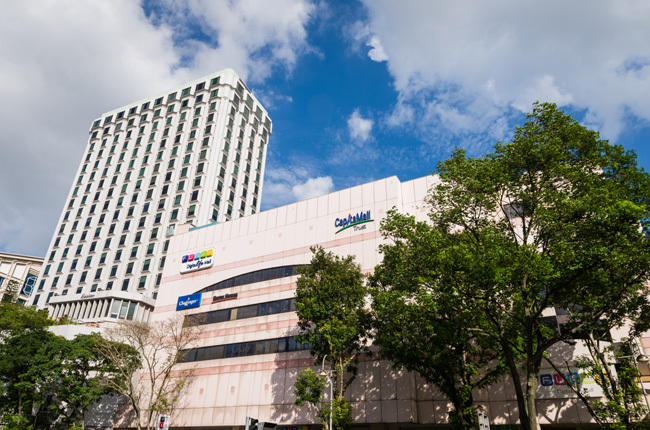 Hock Lam Street made way for developments in the 1980s and the Funan DigitaLife Mall now stands at the site. The archived photos contributed by George W. Porter Collection, courtesy of National Archives of Singapore. Our pioneer generation Singaporeans will remember Hock Lam Street but the present generation will remember this same place as Funan Centre and renamed as the Funan DigitaLife Mall. The ageing North Bridge Road mall in 1985 will close at the end of 2016 for three years of redevelopment at this location. When the newly designed building is completed in 2019, the shopping of computers and IT stuff would serve another generation Singaporeans. For the younger Singaporeans who have not heard about Hock Lam Street and the former place, which was demolished and replaced by the present Funan DigitaLife Mall, the archived photos are posted on this blog with the courtesy of the National Archives of Singapore. Those who have not been to Hock Lam Streets to walk through the place or eaten the food at the make-shift roadside hawker cart stalls or inside the coffee-shop in the old days would not have the memories and sentimental feelings and experiences. Many of the pioneer generation Singaporeans have been there to remember the sights, smell, noise and the taste of the traditional food. For the younger generations to look only at old photos of Hock Lam Street could not register in their minds of a once busy place of a past era, long before they were born. The fond nostalgic memories of Singapore during the prevailing circumstances and conditions. These are the memories built when they are born and grew up at every stages of their life at every generations at different times in Singapore. View of street vendors and rickshaw at Hock Lam Street in 1960, with Tai Tien coffee-shop on the left of the photo. Chinese characters on the pillars indicate that the shop sells ice-cold soft drinks, various types of cigarettes and liquor, as well as Chinese and Western desserts. Photo taken on 15 November, 1974. The popular eating stalls and shops in Hock Lam and nearby Chin Nam Streets. The two streets have been favorite eating spots for people living and working the area teeming with commercial houses. The shops, many of them about 100 years old and standing no more than two storeys high, in rows in a rectangle bounded by Hill Strteet, Coleman Street, North Bridge Road and High Street. A wooden box stall selling “hum chee peng” outside the coffee-shop at Hock Lam Street. Opposite the road was the former “The Peking Co, Ltd”, a popular departmental store. In 1974, coffee-shop at Hock Lam Street, just off North Bridge Road. Hock Lam Street, one of Singapore’s most famous eating spots made way for urban renewal. It is a bustling narrow alley of century-old shophouses, stall and during lunchtime is crowded with hungry customers. In the above photo, the CORTINA Departmental Store was opposite the coffee-shop. The Funan DigitaLife Mall signboard to display the types of businesses in the building. A related blog “How Can There Be Today Without Yesterday” was posted 2 years ago here to remember the Microsoft Windows 95 launch at Funan Centre on 24 August, 1995 at midnight. On 24 August, 1995 , some shops in Sim Lim Square and Funan Centre were running the software on demonstration machines. At midnight, there was a 95-minute sale at Funan Centre where customers could buy Windows 95 for $159. Customers would get a T-shirt and the first 100 buyers would get a Microsoft watch. There was also a lucky draw which one person would walk away with a laptop pre-loaded with Windows 95. I was not there to walk down memory lanes of Funan Centre, a place where I did window-shopping almost every weekends in the 1990s to learn new IT stuff and home computers accessories and devices available in the market. “Finally, it’s here. Come Thursday, 24 August 1995, Microsoft Corp will unleash its hugely-anticipated Windows 95 operating system. And anyone will thinking it’s “just another software launch” should think again. True, the hype is probably unsurpassed in computer history. And true, Microsoft, the world’s largest independent software company, will spare no expense to ensure that the fever remains red-hot. It is reportedly splurging US$200 million (S$280 million in a media blitz. Several million dollars of that was used to buy the rights to the Rolling Stones’ 1981 hit “Start Me Up”, which will become Windows 95 theme song. And Mick Jagger will sing it. But underneath the hyperbole and hoopla is serious moolah – big money for many, in other words. … At the heart of these expectations is the enormous user base that Microsoft currently commands. Its DOS and Windows programs control the internal functions of well over 100 million personal computers on the planet. Now comes Windows 95, whose “friendly face” and ease of use that could win over a couple of hundred million more PC users. Windows 95 is also a resource hog compared to its predecessors. For the computer industry this means more sales as users upgrade their systems or buy more powerful ones. PC makers and their suppliers – the producers of memory chips, large hard disks and the central processing units (CPUs) that act as the brains of their computers – have all ramped up production and racked up sales in anticipation of the boom. The makers of peripherals like printers, sound cards and video cards are seeing a similar growth surge. And because Windows 95 comes with built-in access to the Internet and its own Microsoft Network online service, modems are also set to become hot items. Besides beefing up existing industries, Windows 95 will spawn several new ones, most notably the software applications written specifically for Win 95’s powerful 32-bit engine. Such programs will run faster, multitask more gracefully and interact more seamlessly. Not surprisingly, Microsoft’s will be among the first; it debuts its own suite of applications, Office 95 along with Windows 95. Then there are the legions of writers, publishers, instructors and consultants, all eager to teach the user a system that’s already supposed to be intuitively simple. All of which add up to thousands of companies, and millions of people, with a common vested interest to see Windows 95 succeed. Just a software launch? Coronation sound more like it”. I did not plan to rush down to the Funan DigitaLife Mall to follow the crowd or join the “cheap cheap” bargain hunters at Challenge Funan Closure Sales if I did not have anything which I need. Its ok for me to give it a miss. Why then did I change my mind? I went there on Sunday, 10 April, 2016 evening because the MacBook which I use for about a year is installed with the Mac OS X (Version 10.5.8) doesn’t work with WordPress. The MacBook is still in good working condition, but the Mac outdated operating system was not supported by WordPress to add new photos in my blog’s media library. So “boh pian” (no choice) to carry on blogging at WordPress to spend my recreation time to blog as a “hobby” to share with my nostalgia friends in Singapore and overseas. With thanks to the WordPress “Help Team” to investigate and troubleshoot the problems I encountered for about a month. What happens next? Where to get a good buy new Windows laptop computer with a tight budget. Fortunately, I managed to buy a new laptop (11″) at $299 at an affordable price with basic and simple feature.